This is my last post from my trip to Barcelona. 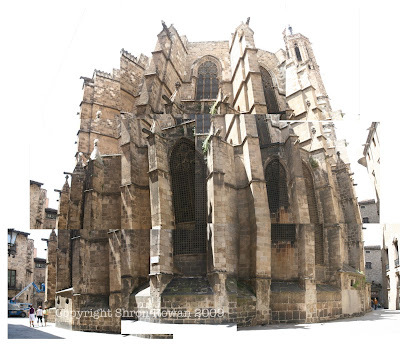 This is the back side of the Cathedral de Barcelona (the same cathedral mentioned in my last post). Instead of taking one picture, I took several pictures and put them together. I used to do these photo montages all the time in high-school and a couple years following (my senior year BFA project was a series of photo montages), however I've never done one with out pictures in one hand and glue in the other. It's a lot different making a digital montage, but still pretty cool seeing the results. I think I'll take a series of pictures of the Eiffel tower and perhaps some other large architecture when we go to Paris later this week.